Our landscaping business has grown in recent years. We have done a lot of work with home owners on the Catskills Mountaintop. Here we highlight a number of recent projects and describe our design ideas and approaches to some very different settings. These Kerns Landscaping Features show you examples and explain some ideas that we employ when we approach a new project, whether we start afresh or when we add to or rebuild existing gardens and woodlands. You may find the ideas useful and adaptable to your own setting. We have an experienced team at Kerns and would be very happy to discuss ideas about a project for you. Home Landscapes:Whether you have a new home or old, we can landscape your living area to suit your needs and desires. We will come up with complete plans to accomplish these goals. When Kerns and a new customer discuss plans for landscaping a property, we don't just propose how many shrubs, bushes,trees and plants the project will consume. Instead, Bob Kerns will propose a range of original ideas suited to the particular terrain and soil. We will suggest various home landscape themes, shade & woodland gardens, rock gardens, garden borders, herb gardens formal and informal, even an old fashioned Victorian garden. Instead of gardens, we can suggest many different woodland landscapes where appropriate. We will suggest that you consider patios and walkways. We can build various path systems, with gravel, logs or rails, etc. We will make tree and shrub plantings if you need to block a view of a neighbor's house or property. For your new landscaping project, we will draw on the wide resources of the Kerns Nursery, and on a wide network of suppliers. 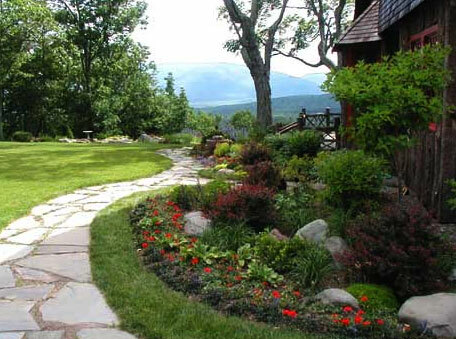 All plants we will use in your project will be suited to the Catskills climate and soils. 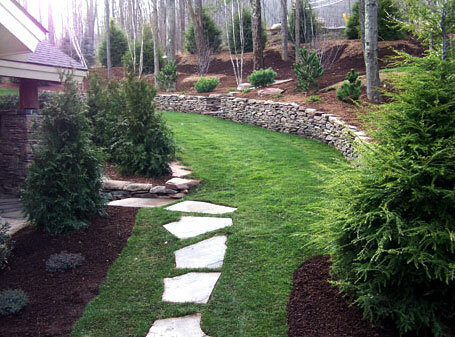 Kerns Nursery solution: We may be able to come up with a good solution to your landscaping project. Give us a call and schedule a consultation!